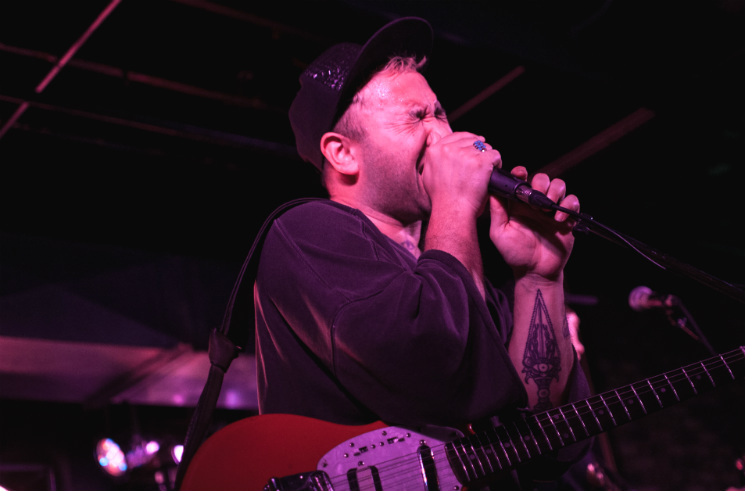 Almost a year to the day after the release of their third studio album, Multi-Love, a sold out crowd greeted Portland-via-Auckland psychedelic rockers Unknown Mortal Orchestra last night (May 25) in Calgary. In that time, the group have enjoyed increased popularity, leading to performances at festivals such as Coachella, and scads of sold out concerts. Whitney played the first set of the night, a band that only formed last year. Their core members are vocalist and drummer Julien Ehrlich (a former member of Unknown Mortal Orchestra) and guitarist Max Kakacek (formerly of Smith Westerns), and they were joined by another guitarist, bassist, trumpet player and keyboardist. Whitney played light, playful indie pop from their upcoming debut album, Light Upon The Lake. Joyful guitar and trumpet solos fleshed out their sound. From the moment Unknown Mortal Orchestra took the stage, it was clear that the audience were in for a highly energetic night. The band played as a unit, with intuitive knowledge of each other's playing, bringing the grooves and complicated melodies characteristic of their work to vibrant life. "How Can You Luv Me" highlighted bassist Jake Portrait's funky tendencies, while "Ur Life One Night" got the crowd dancing to its infectious guitar and bass lines. Bandleader Ruban Nielson can write a great, poppy guitar part, but what's truly incredible about his playing is its fluidity and his improvisation during solos. It's less self-congratulatory, and more virtuosic than most. "The World is Crowded" took things down a notch, its romantic melody enrapturing the audience. Quincy McCrary's light synth lines juxtaposed drummer Riley Geare's steady beat, while the bass and guitar added texture to the song. Unknown Mortal Orchestra excel at minimalism, which was perhaps best heard in their performance of "So Good at Being in Trouble." Keyboardist McCrary shone during a break of jazz and classical influenced improvisation, before Geare joined in on drums. A handful of strong cuts from Multi-Love completed the set, the ever-changing rhythms of "Like Acid Rain" keeping the crowd on their toes, while "Necessary Evil" experienced a tech mishap before the band hit their stride again. The band went out with a bang, "Can't Keep Checking My Phone" getting the crowd jumping up and down with its tight polyrhythms. By the end of the night, Nielson expressed immense gratitude and told the crowd that he genuinely loved Calgary. After experiencing this varied and powerful group of songs live, it's safe to say the adoration goes both ways.